How cute is your card, such a sweet little bunny and the paper is so great behind it. Love it. Absolutely adorable and wonderfully distressed! Love the red and the polka dots. So happy you joined in the fun with us this week at Our Creative Corner. 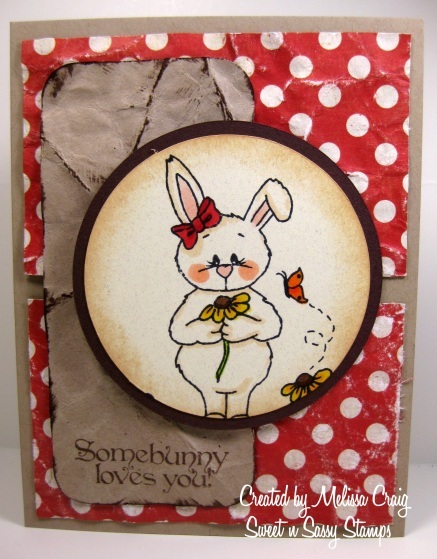 You have some serious distressing on your card...I love it! Great job with the sketch too. Thanks for playing along with us this week at Our Creative Corner! How adorable, love the dots! Thanks for distressing our sketch at OCC this week! Love your card. And isn't distressing a wonderfully artys way to destress? I love those polka dots! Thank you for playing along in our challenge over at OCC. Hope we see more of your creative work!